There are many organic pest control options out there…not all of them from a bottle. As more people develop an interest in vegetable gardening, finding organic ways to control pests has taken center stage. Organic pest control can be initially overwhelming, but with a few techniques, the home gardener can promote beneficial organisms and reduce the number of harmful creatures in your garden. To start, the best pest control is a healthy plant. Plants that are well drained and have nutrient-rich soil can better handle the occasional pest invasion. Use compost in your soil to encourage the development of beneficial organisms that combat disease. Crop rotation keeps your soil from ‘wearing out’ and reduces the buildup of any one pest variety. Along those lines, diversity in your garden will also help reduce pest populations. Companion planting can help inhabit certain pests as well as encourage the growth of your vegetables and plants. For example, plant sunflowers in your garden and attract birds that feed on harmful insects and plant marigolds around tomatoes to repel pests. If you’re lucky enough to have chickens or ducks, they’re great at naturally controlling garden pests. Ladybugs are also wonderful to have in a garden, they’ll eat the aphids that can wreak havoc on your plants. There’s also a wide variety of organic substances that can be applied to your vegetables to control pests. For more information on organic pest controls (including organic oils and sprays, minerals, and microbials) check out our more in depth article on our website here. 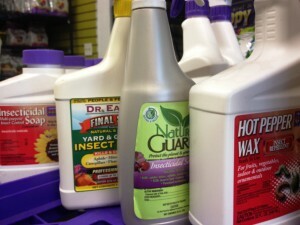 This entry was posted in Gardening and tagged gardening, organic, pest control. Bookmark the permalink.